Ohio is ready to double public transit investment, but is it enough for struggling Cincinnati Metro? Along with an increase to the state's gas tax, the Ohio General Assembly is poised to approve nearly $70 million in funding for public transportation — a move that would double Ohio's current investment. The increased funding wouldn't come directly from the gas tax — that's reserved for road and bridge projects exclusively — but it's a move intended to boost what has been a meager investment from Columbus into the state's 61 transit authorities. According to a 2017 study by Ohio Policy Matters, the Buckeye State has the 14th highest demand for public transit service among the United States but earmarks less than one percent of its annual budget to transit agencies. 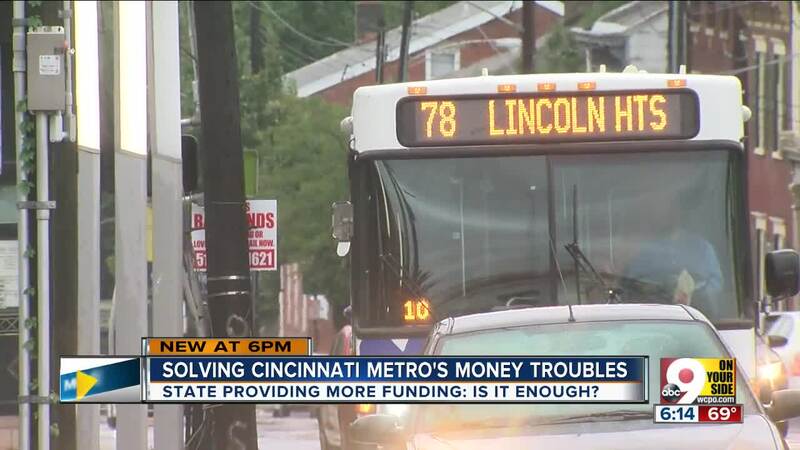 As the Southwest Ohio Regional Transit Authority faces a $60 million deficit over the next decade for its Cincinnati Metro bus service, it remains unclear what the assembly's investment would yield locally. Everyone agrees that the region's largest bus system needs a new way of paying for the services it provides and doesn't meet the needs of the public. As WCPO's I-Team reported last year, the majority of Metro riders don't have a place to sit or shelter from weather while they wait for the bus. Riders have also lobbied SORTA for increased frequency on a number of major routes as well as extended hours of service. "It’s very hard on people, especially mothers with children, people with packages, seniors, people who have physical injuries. You know, it’s difficult," said daily Metro rider Barbara Wolf, 77, of East Walnut Hills. Her bus stop on Madison Road offers neither a bench nor a shelter. Metro's current funding model was implemented in the 1970s and relies primarily on a portion of the city of Cincinnati's earnings tax. SORTA Board of Trustees Chairman Kreg Keesee has spent the tenure of his term on the board searching for a new funding solution. "We know with the funding we’ve had the last several years, we’re not able to provide service the way we’d like to," he said. "We’d like to be able to provide every-15-minute service. We’d like to provide overnight service on our major routes, those kind of things, but we don’t have the money for it." Keesee said with current its current funding, Metro will exhaust its financial reserves by the end of 2019 and face down $5-8 million operating deficits for the next two budget years at least. As for state funding, Keesee said it's been minimal. "Not very much — less than a million dollars (a year)," he said. Metro's annual operating budget tops $100 million, the majority of which comes from the city of Cincinnati's earnings tax. Keesee said he's not sure how much of a difference a $70 million investment will make for the dozens of transit agencies throughout the state. Lawmakers are still working out how the state will disperse the extra funds, but Metro's funding problems are deeper than the state's boost can feasibly fill. "It doesn’t change our funding overall, so if we get another million or two million dollars, that’s substantial money and we appreciate the state providing it, but it won’t change the underlying financial situation for SORTA," Keesee said. "So we’re going to have to address our unsustainable financial model soon."